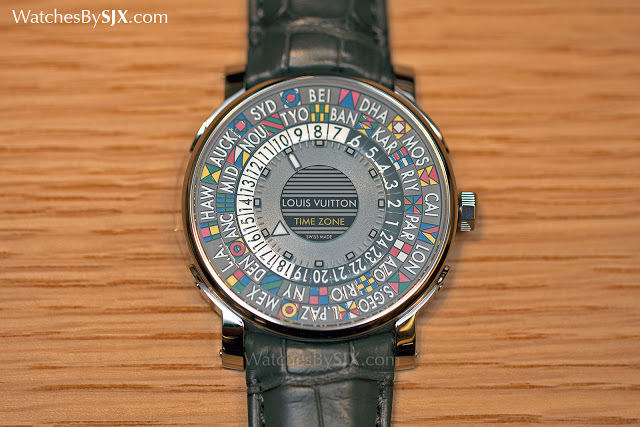 Priced at a just tenth of the Escale Worldtime launched last year, the Louis Vuitton Escale Time Zone offers the same look, slightly reduced functionality in an attractive package that’s much easier to swallow. 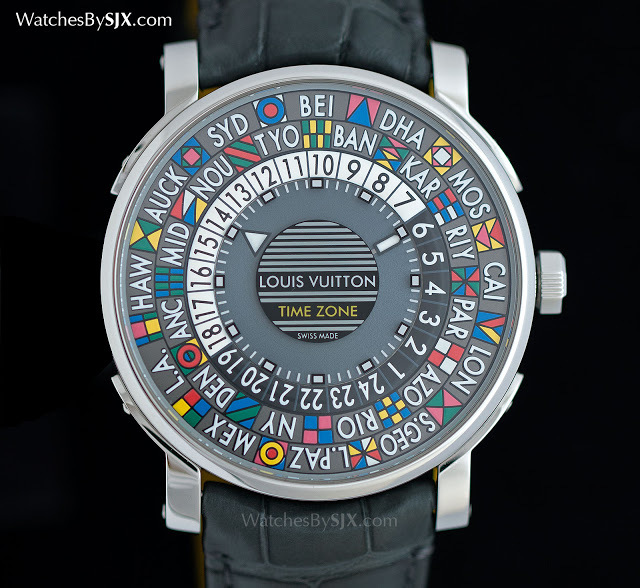 Last year Louis Vuitton introduced the Escale Worldtime featuring a multi-hued, hand-painted dial. The look was striking and attractive, and the movement was a clever one, being conceived by La Fabrique du Temps. But it carried a price tag of €50,000, or about US$55,000. The Escale Time Zone, on the other hand, is vastly more affordable. Unveiled at Baselworld 2015, the Time Zone offers the same look, but with a dial that is printed rather than painted. The salient question here is not whether the Time Zone is as good as the limited edition wWorldtime, which costs 10 times as much – it isn’t. But how good is it in its price segment of US$7700? After wearing one for several days, the verdict is positive. 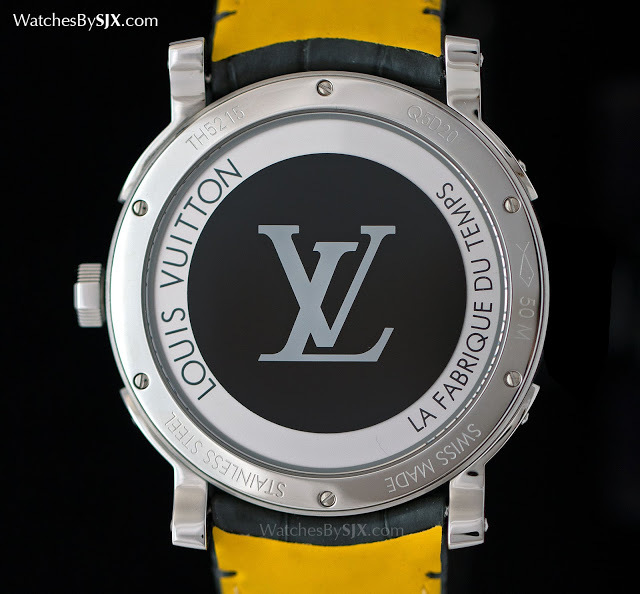 The dial tends to attract a lot of attention from observers, who are usually surprised when they find out it’s a Louis Vuitton watch. Functionally it is basic and easy to understand. Everything is set via the crown. The time is indicated by the hands at the centre. The local time zone is positioned via the crown at 12 o’clock (“BEI” for Beijing or GMT+8 is shown in the pictures) as the reference time zone. All the other 24 time zones around the world can be read with the 24-hour ring. In the picture above, it is 10:10 am in Beijing and 2:10 am in London. 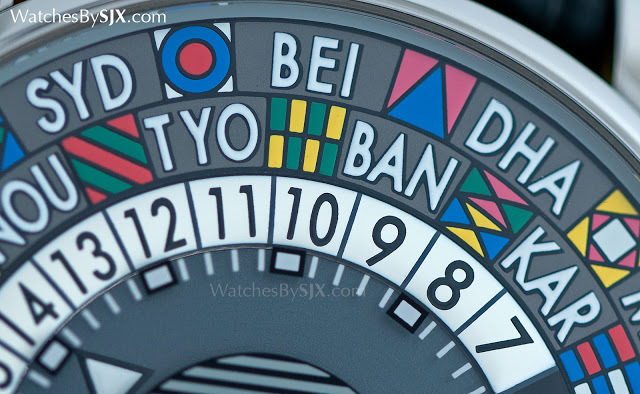 The multi-coloured dial is distracting when reading the time, but it is the most appealing aspect of the watch, one that’s worth retaining over legibility. 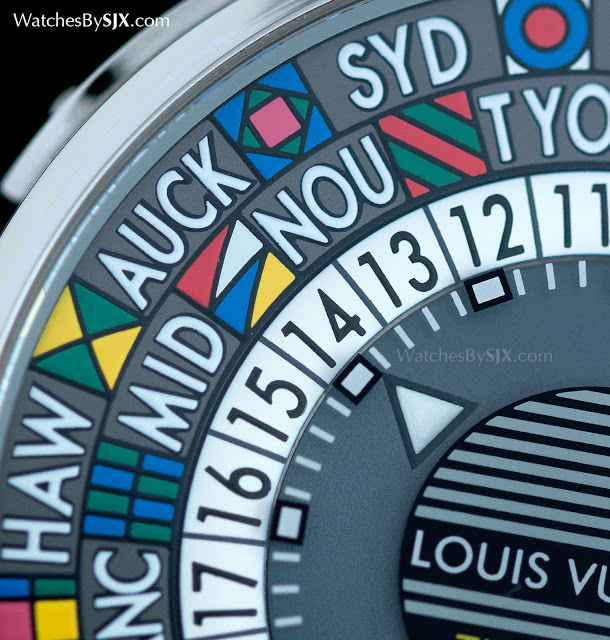 Unlike the hand-painted dial on the Escale Worldtime that takes some 50 hours to complete, this has a printed dial. It’s made with an automated process that is speedy and efficient. At a glance it’s difficult to distinguish between the two dials, hand-painted and machine printed, but the differences are apparent. The printed dial colours are not quite as vivid (which is probably intentional rather than a result of the process) and the lines aren’t as crisply defined. Yet for what is the dial scores well, particularly given the complexity of the dial (text and colours). 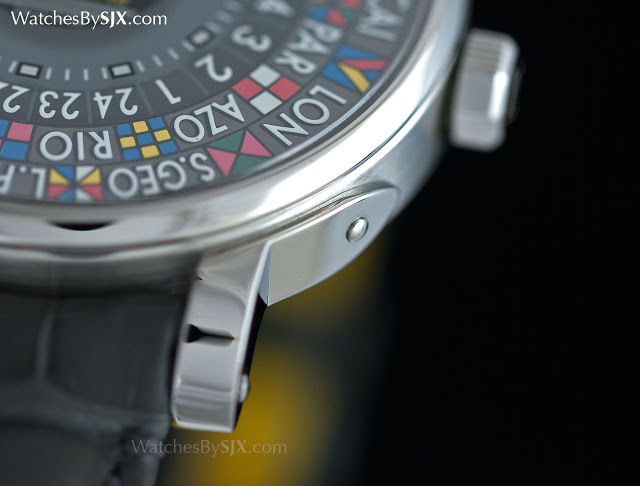 The dial is likely the most expensive component of the entire watch. The watch case is simple case with distinctive details, and one that is well executed. It’s 39mm and in steel, lacking the heft of the 41mm white gold case of the Worldtime. Visually though it’s almost identical, with the same lugs that are modelled on the riveted corners of Vuitton trunks. 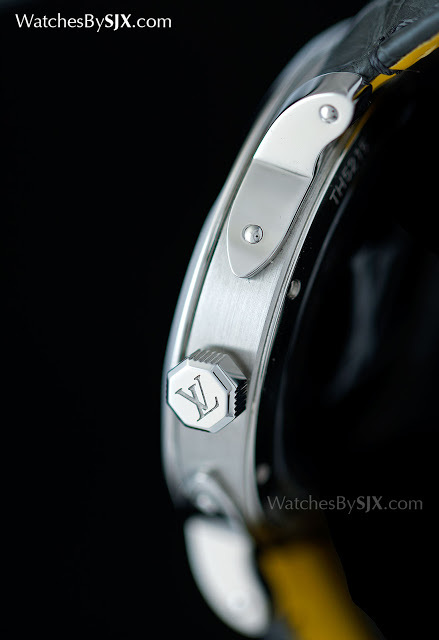 Even the view form the back is similar to the Worldtime, with the same mystery rotor surrounding a silkscreened “LV” on the sapphire crystal. Underneath the back sits an ETA 2892 automatic, a reliable movement and a common one at this price point. The inevitable feeling with the Time Zone is that it is the less accomplished sibling of the Worldtime. It’s like comparing a Cayman with a 911. But the Time Zone is strong contender in its price range, where most of the offerings tend to look generic. It is different, attractive and well made. The Escale Time Zone retails for €5300, US$7700 or S$10,300. 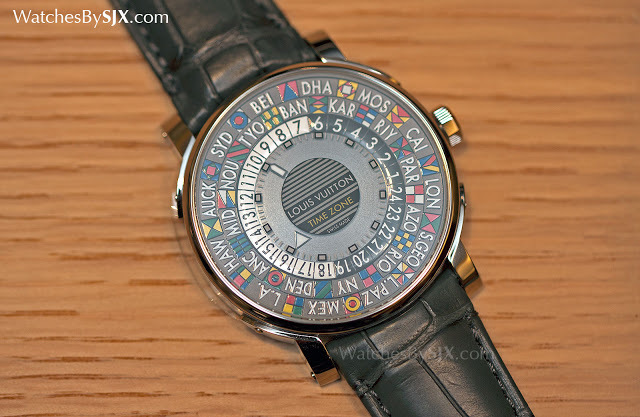 As Louis Vuitton shifts its watchmaking efforts into high gear with its new factory, it promises a slew of new and unusual complications, the first of which is the Escale Worldtime, a clever and colourful implementation of the traditional travel watch.